I usually cringe and groan inwardly when I am faced with a book that has obviously skipped a few fundamental steps in the getting a book to market process. Such things as Spell Checking, Editing, and Proof Reading, are critical. To the old grizzled, and long in the tooth reviewer that I am, skillfully avoiding these steps is a cardinal sin. And a sin that reflects directly on sales. However, once in a great while you find a diamond in the rough. And that very much encapsulates Thru The Devils Door. It is a compelling story, and one that needs to be told. One thing that is crystal clear is that Mr. Clifford is bound by the secrecy laws, and has been hog tied about naming names or places. The documentation supporting his assertions will fester in long forgotten and mildewed file cabinets before 50 years before they become declassified, or, in the more likely scenario they will have been conveniently lost! OK, I can hear you all asking, so what is the hot tamale? Well how does bio-weapons grab you? Thru The Devils Door runs less than 100 pages, and 60 of the pages concern his life history. The last 20 pages though make fascinating reading. In the UK, which is where I am originally from, the government would have slapped a ‘D Notice’ on this book before it had even been printed. For those of you not familiar with the jargon, it boils down to ‘print this and you go to jail’. Using the shield of ‘plausible deniability’ the US government will no doubt claim no knowledge of the programs that Mr. Clifford talks about. And of course Mr. Clifford has no opportunity to offer any definitive proof without facing serious jail time. I believe the term is ‘Mexican Standoff’. I don’t usually subscribe to the ‘conspiracy theory’ line of thought. I don’t think there are aliens at Area 51, and I don’t think that perpetual energy machines work. But I do know that many things happen behind closed doors, that we as citizens should be made aware of. Bio-warfare is not a great option, really bad things can happen. If as Mr. Clifford ascribes, the bio-war may well start from within our own research facilities. Not by some crazed Al Qaeda plot, but through sheer stupidity. Where did that Anthrax come from that ended up in Washington DC in November 2001? Was it a US grown strain? Great little read, but if I was the author, I would yank the book from sale and rework it a little bit. He garnered credibility from me by the minutia in the text. It is easy to BS the reader on the big stuff, but the little stuff, thats a whole different ball game. The last 20 pages could become a 300 page best seller. You can get your copy from Outskirts Press. 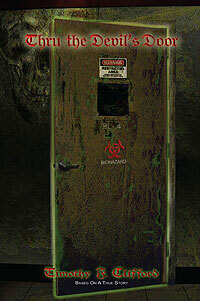 2 users commented in " Book Review: Thru The Devil’s Door by Timothy F. Clifford "
Did he work with bio-weapons as a researcher? I had the pleasure of working with Mr. Clifford, post-government work, while he was writing this book. 100 pages cannot contain the stories this man has to tell. I don’t believe 1000 pages could contain the stories he could tell if he were legally allowed to. Read this book and let your imagination run wild thinking about all of the things he would have said if he could.